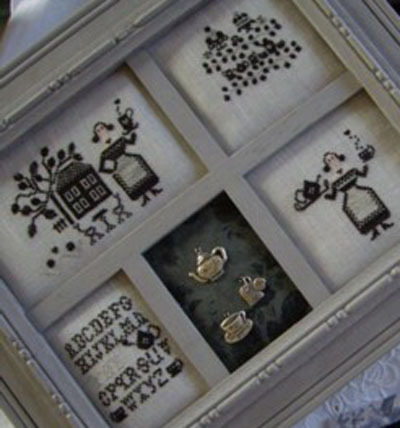 "My Tea Cup" is a cross-stitch chart with instructions translated in English. It comprises 5 patterns + finishing instructions. Special stitches: This is a cross-stitch design with some daisy stitches, spider web stitches, eyelet stitches, French knots, feather stitches and tambour stitches. There are clear diagrams and instructions on the chart and you can choose to replace these stitches by regular cross-stitches but the result won't be the same. The model on the picture has been stitched on a 40 count linen fabric (colour "faded blue") using one strand of cotton over two threads of fabric except for the pattern 5 which was stitched as a miniature (one strand of cotton over only one thread of fabric).